Use base when you feel you really need to use it. Originally do not be use to using makeup base. Of coarse there are places you don't need to. The foundation has evolve to cover up most of the blotches on the face so don't start using makeup base at the first place. Don’t have an idea that not using the makeup base before foundation would destroy the skin. It is not true! So don’t waste your money on base products but find a perfect foundation for your skin. 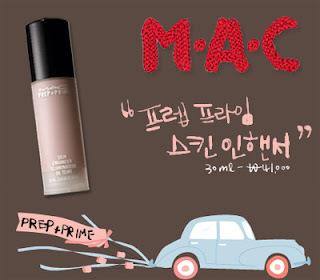 I always use Mac strobe. I don’t really want to be more white or trying to cover pores. I have some blotches but I don't really think about covering it. The makeup doesn’t easily fades away so it doesn’t make me to use makeup base. So sometimes I use foundation right after sunblock. When the time passes I don't like to feel the stiff feeling in the skin. I love the watery moisture instead of the oil so I use Mac strobe. 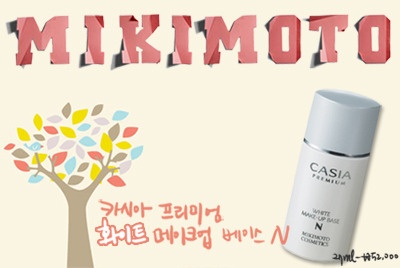 Saying it clearly, if the fundamental cosmetics are enough to be moisturizing than you don’t have to use it. There are some people who use makeup base and primer. I am not saying that it is wrong to use. There are some people who need to use two of them. However, you need to spread those two for different areas in the face. It is not like using upon layering. If it does than the effect won’t be seen. It smells like peach so everyone who smells it makes them feel happy. I heard that among the color ‘50jade’ green color is limited. Anyhow I didn’t use it so moving on to the other 4 colors. Rose (pink tone) this is the most popular color. It makes the skin look healthy. But it depends on the tone of the skin. For people who have fair skin could look brighter but for the people who have dark skin won’t settle. Mimosa (Melon tone) comparing to the yellow color base it is not the great effect but can lower down the red blemishes. However there is no brightness to the face. If the red blemishes aren’t all over the face than use it little. Aruze (sky-blue tone) the pigment of this is the best and with the glitters it brings out the color of the face. I don't know about the re touch after. If you have so pale skin like mine than it would look like you have bunch of glitters on the face. Even after the cleansing, there are some glitters left behind. I want to remove it by using the tape! The product is so liquidly when you put it on your hand, it drips down. So it really helps to apply smoothly. When you don’t apply by little bit of amount than it can settle thick at one place. 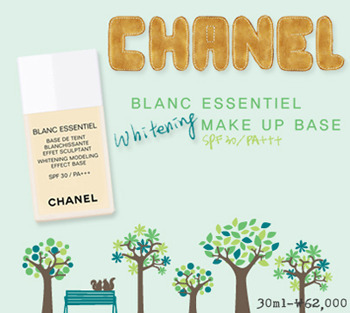 It is similar to Chanels’ with a feel of fine powder texture for the finish. I don’t know why people were so crazy about this product. However it does help the makeup to last longer. Also helps the foundation to settle onto the skin and makes the skin 1 tone brighter but that is it. 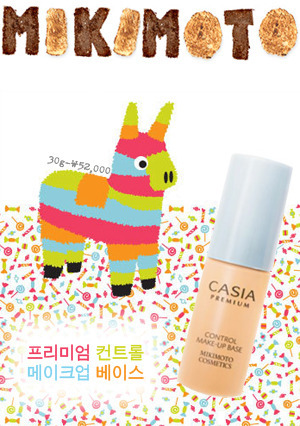 When you use it at the time when the skin is at the best state than you can see the effect but when the skin is not at the best than it is like same as using a makeup base that costs 10,000won or so. Looking at the price I thought that in the worst state of the skin will help to bring up the tone but it didn’t. Moreover when you don’t control the amount it might look too much white or too much makeup on. There are some revision on skin tone and can make it brighter than actual. But this doesn’t apply to all type of skin. If the skin is smooth enough to go out without foundation, than it is possible to use only Rose makeup base. It helps to make the skin look smooth. After the fundamental skin care applying sunblock, primer, base and foundation is really not recommended. It is not a product that you need to have great support. It is better just to care about foundation. but this works only for the light pimples. If the pimples are big or scooped in a shape than applying on the top will make it look worst. The most important is that it’s dry. So when you lessen the fundamental skin products because your too oily and using the matt foundation could control the oil on the face but it looks too dry. When you use well of fundamental skin cosmetics than you could be free from dryness. However when your skin is dry I don't recommend this product even though you did strong foundational skin care products. It’s fine at first but it gets drier from the inside and as time goes by, there are wrinkles showing. For most of the people who hopes from this products is to make their skin look like a soft skin like from peach. For the fair or yellowish skin that has red blemishes is good to use but for the people who have dark skin tone than I don't recommend. At first it looks bright and when the time passes the under tone of color comes out beneath the makeup so it darkens the tone even more. The color looks very dull. The makeup in the hair and the neckline fades away. So have to use a product that matches the skin color or not too much of a difference. So using the color that matches the skin tone could bring the natural color to the face. Using the highlighter to bring out the face line is important. Adding the highlight where you need them is a way to look pretty. First you have to organize the skin tone so adding the highlight doesn’t look over doing of makeup. This is similar to Chanels’ in terms of size of the glitters. It is called a makeup base or primer. It is in the middle of this two. It doesn’t function like a base or primer. This is a product that is just a glitter liquid. You can apply before the foundation. It provides the fine glitters without any base effect. Of coarse you can mix with the foundation. However when you are applying all over the face it is not good to use in 1:1 ratio. For any brand that is popular these days have glitters on them. So there is no really big difference compare to others. The only positive commend on this is that when you mix with the foundation or not it is very light. So it is perfect to use for a summer time. When you look from the appearance it looks the same but there is a difference with the layers. For the people who want to have shiny skin but can’t because of the heavy feeling of the glitter, they should consider buying this. You can control the amount you apply. So there is no over doing of makeup. It is not that moisturizing compare to Chanel’s makeup base it is much less drier. #2 (bage gold tone) this color is recommend to ordinary skin tone and for darker skin tone. As I have said before, if you have dark skin tone than have to focus on looking healthy. It doesn’t mean that bright skin tone is always pretty. This product helps to look pretty for people who have darker skin. Of coarse this applies to people who don’t use powder that much. In doing makeup you have to pay attention to the glossiness. #7 (bright pink tone) it helps to give light to pale skins but there isn’t great effect. Before the foundation you apply this lightly to the place where you use to place highlight. For the people who apply thin foundation is useful to use this product. #12 (pink violet) I expect to give coverage for red blemish and even out the tone but there wasn’t. Compare to #7 there is more glitters. This can too much so #7 looks more natural. For the people who have healthy looking skin mix with a tint giving greater looking skin. This product was recommend by friends around me. I was thinking whether should I buy or not due to the small size. If you don't really need to use makeup base than don’t use it like a automatic. According to the skin decide should I use makeup base or primer. There is only difference in names between the makeup base and primer. Instead of going for what to choose by its name consider the function of the products. This is clear gel type similar to other primers. The application is great and after it makes the skin really soft! It helps the foundation to stay longer. 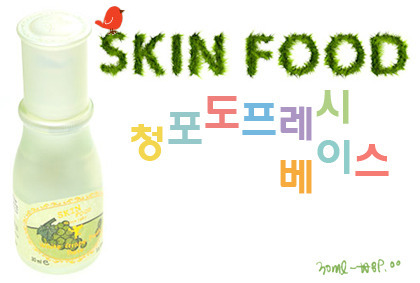 After applying, it makes the skin flawless and doesn’t give dryness feeling so it’s fine. But don't expect to cover fine wrinkles because primer is for covering the pores. This is recommended to people who gets their makeup easily erased and who have too much oil on their face. It holds the oil and lessens the glossiness. 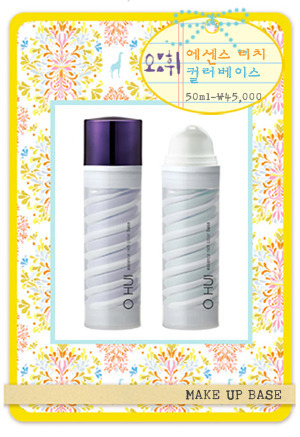 People who have large pores and thinking to buy this aren’t a good idea. This can be compare to the Chanel’s makeup base. This is liquid type that is really similar but is less dry. I can tell you that it gives brightness. However for the name of makeup base the coverage and making the skin even tone is totally zero. When my friend came over she wanted this product so right away I gave to her. When you have good skin than it makes it better. But for the daily use, it is less functional than cheaper makeup base. It helps the foundation to stay little bit longer. I don’t recommend this for people who have oily skin; it brings out the oil even more. This number isn’t safe to use it for a summer time. It has really tiny glitters. after the foundation, you can’t see a thing. You don't really feel that you need this for your makeup. When you don't want to apply anything, than I use sunblock than I use this product. It gives little bit of revision but don’t have any coverage so my friends think that I didn’t have anything on. When you have fine skin condition and when you use this it helps to look better. This lacks moisture so you have to have use strong fundamental skin care cosmetics. As you see from the appearance. The appearance looks like mixed essence and base. When you pump it out the contains doesn’t mix well so have to use your hand to mix. Of coarse it isn’t that hard. You can’t really expect to see any moisturizing effect. Among other makeup base, it is moistening but it doesn’t last long. There isn’t a feeling where it makes it dry from the inside of the skin. According to the skin type you can choose but there aren’t too much difference for a revision. Instead of moisturizing effect, it supports the skin care system better so for that reason I use this. When you apply too much skin care cosmetics in the morning, it might increase the oil in the face. Instead of paying attention to the skin care in the morning concentrate on the retouch of the makeup. After finishing up the makeup. Pump out the product on to your hand than use the latex sponge to apply onto the face and the stroke should be like in wiping motion. Apply according to the direction of the skin texture. This helps to remove the oil and dust on your face. Also clean up the place where the makeup is unsettled. After apply the sunblock than foundation and its finished. It is just revising the skin so when you are applying the sunblock and the foundation you have to apply gently. If it isn’t than might destroy the skin texture. It is more effective and faster than to use a mist. Recommended to medium dry, and dry skin type. Caution: wash the latex sponge frequently. The case is made out of plastic, which is very light but compare to the price, it looks inexpensive. There are some other cosmetics that are good in quality but the casing looks cheap so I don’ really want to buy it for a present. As I have said above this is similar to makeup base or primer. It lacks in revision of the face but contains glitters and makes the skin look glossy. Illuminate (lavender tone) is the light pink and light purple color type of product. It supposes to make pale skin to look bright but it doesn’t really work. Neutralize (yellow tone) gold orange glitter that brings down the red blemishes. Aside from the glitters there aren’t really an effect. It is better to use foundation or concealer. Adjust (peach beige tone) lights up the dullness on the face. According to the product these days it is very liquid in form. It is lighter and settles better than Chanel. But don’t expect to have coverage on the pores or any revision to the skin. It gives little bit of light to the face and it is great to use during the summer. Compare to the last products it is much better but I don't know if how many people are going to buy. It helps to brighten up the face alone instead of using it together with the foundation. There are some glitters but when you use foundation on top won’t show the glitters. If the skin is well cared than it will help to look glossier. Like the product of Chanel there is an effect right away but using the wrong amount and doesn’t go well with the skin color might make it whiter. However for this product there is no worry for making the face too white. Of coarse the brightening effect is less than Chanel. There is no control of oil and it isn’t moisturizing. This is just a liquid that contains glitters. Comparing to other inexpensive products it is lighter. It applies like a cream instead of like an essence. When you think of the stickiness right away it turns very soft. Where there is a fine wrinkle on top of the hands it fills up the space very little so can still see it. However face skin and the hand skin was different. For me I didn’t have a problem with pores or any blotches on the face. You can’t really feel it if the pores are getting filled in. I called my friends to try applying this but it show all the pores. There are some functions of controlling the oil. Even though it function as controlling the oil it works very lightly. I bought this for 30,000won and the amount it contains is not worth of a price. Applying to my skin it is very natural. It works as sunblock, makeup base, and foundation. 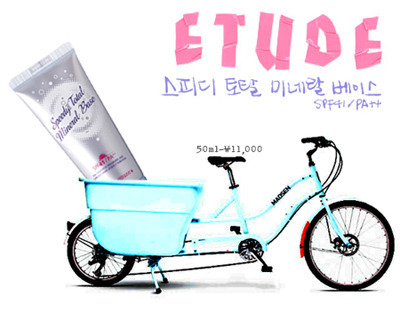 Etude said it is multi mineral base. For the sun protection, the number is high but I can’t make sure if it works. For the name of makeup base, the coverage is fine. So it says that it works like a foundation but actually it isn’t. This is really light gel type so there isn't any moisturizing feeling. So I don't really to recommend to the people who have dry skin. If you want matt product than use it. I don't really know whom should I recommend this to. It doesn’t really helps the foundation to last long or brightens the face. However there is only one useful place. I bought a foundation that was so liquid type and it was too much so I didn’t used it. When you need some coverage than apply the foundation and on the top apply this makeup base. The coverage increases and the foundation last long. Instead of mixing those two, apply separately so the effect is greater. It is like applying two foundations. In order to use this foundation you don't have to buy the expensive makeup base to go with it. So in terms of saving the money buy this inexpensive product that goes well together. This was liquid type makeup base. So I was excited in trying it out and what effect can it give. Same as like the Channel, there was an effect of revision on the skin tone. There was higher effect than I expected. I could really tell the difference by the appearance. There was a totally difference in before and after. Due to this brightening effect there is a problem when you can’t control the amount. It is a negative point of this green base but compare to the pass days it got better. You can check it by your eyes when you apply so it isn’t too hard to control the amount. However there is no moisture but plain dry. So this is not recommended to dry skin. This is for people who don’t have dry skin because the application is really light. Aside from just brightening there is no effect on covering the red blemishes. What is the most important thing after using all of the products above? I use to recommend cleansing but some people say it is too strong or light for them. There are no answer to which cleansing is the best. Just use a cleansing that cleans up the makeup well. I don't really like strong cleansing so I keep my makeup really simple. After the fundamental cosmetics I use sunblock and the compact foundation. Using the glitter primer like the products on above; be reminded that using a cleansing that works for you is the best. If there is an unused glitter base than take it out. If it is too old and changed its color or texture is different than throw it away. Other wise if you have a glitter base that is fine use it with a sunblock. When you apply it around legs, arms, and in clavicle it makes it look really glossy. You can use a product actually made for those area but using with a sunblock have better effect. If you use it to school and work your legs would appear very shiny.